A lot of cyclists are a bit sceptical about running as a complementary exercise to cycling, but I think they work well together. I actually took up running about 12 years ago as a time efficient form of exercise, and when I took up cycling ten years ago, I continued to run. When I say run my ‘jogging’ is fairly slow but it is aerobically intense enough for me. 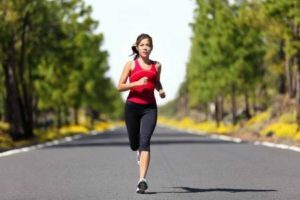 Running is an incredibly time efficient way of squeezing a cardiovascular workout into a busy weekday and it doesn’t require too much kit or preparation time. That makes it ideal if you have a busy schedule. I run two mornings a week, about 3.5 to 4 km each time, which only takes about 25-30 minutes including a good stretch afterwards. For me it seems to work well to control my weight. I spent my twenties and thirties on the “yo-yo diet” treadmill and when I reached my forties I discovered running and cycling, and things started to change for me. Running twice a week helps me stabilise my weight so I can still enjoy the food and wine that I enjoy. My mother was diagnosed with osteoporosis a couple of years ago so I need to keep an eye on my bone density. One of the things that aids in retaining good bone density is weight bearing exercise and running is certainly good for that. In fact I’ve had a bone density scans and I’m already considered on my way to osteoporosis so as well as taking some vitamin supplements, my GP prescribed weight bearing exercise. I’ve always incorporated a stretching session at the end of my run when my muscles are nice and warm. For some reason I’m not as diligent about stretching after riding, so by running twice a week I’m getting at least two stretching sessions. I love cycling in the morning before work, but to get in a decent ride I need to get up by 5.30 am. To go for a morning run I can stay in bed until 6.15 am which might not sound like much but it makes a big difference to me, because I hate getting up really early, and I like to get eight hours sleep every night. When I ride I prefer to have a few companions but when it comes to running I’m happier on my own which means I can decide at the last minute to go for a run. Having said that, I usually decide the night before and get my gear out ready which encourages me to ‘just do it’. Like cycling, running is something that you can increase the intensity as your fitness improves. You can add in intervals, and aim to increase your speed which gives you more value from your workout. Do you use running as a complementary exercise to cycling? Share you experiences via comments or the Women Who Cycle Facebook page.